To be fair, lighting can make a big difference in the appearance of petals and leaves, but some simply aren’t black by any stretch of the imagination. One I fell for early on was ‘Black Prince’ snapdragon (Antirrhinum majus). 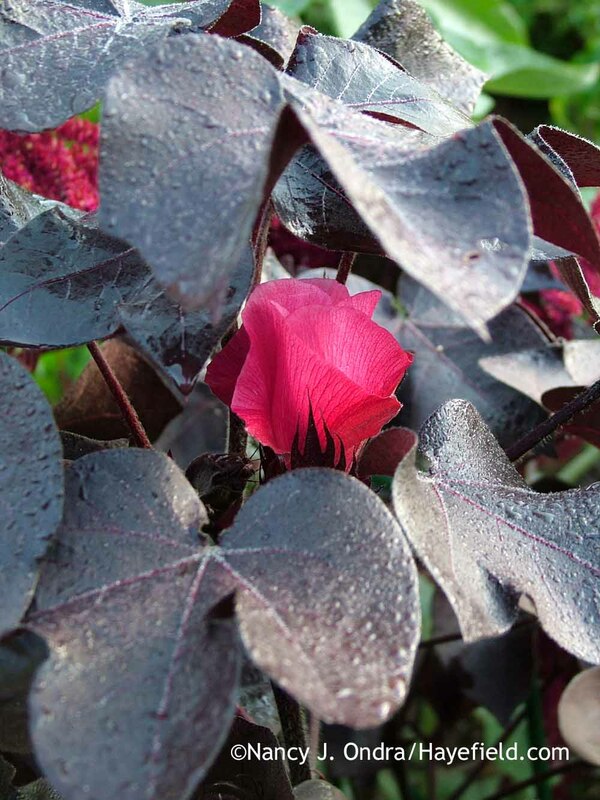 The foliage can have a reddish blush in some conditions, and the flowers are a sultry red, but neither one qualifies as black. The same goes for “black” sweet Williams (Dianthus barbatus), such as ‘Black Adder’ and ‘Sooty’. 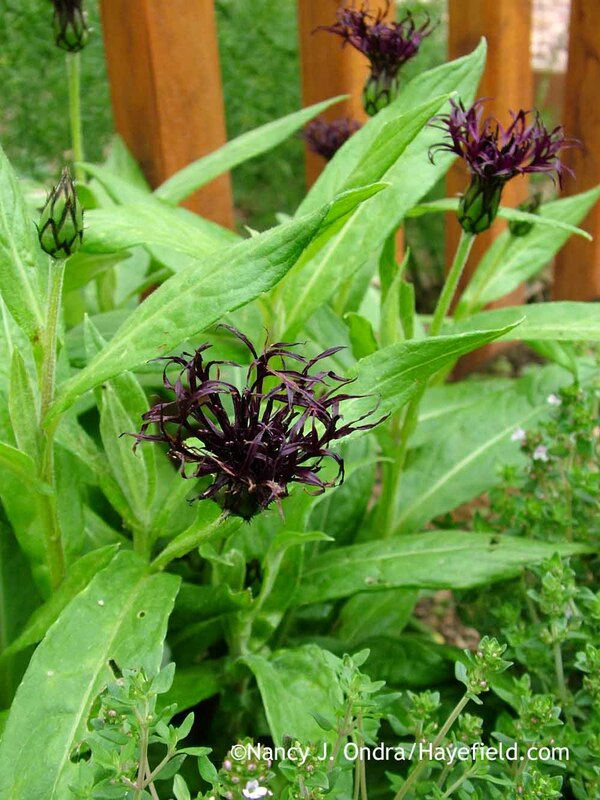 …and so are those of perennial ‘Black Sprite’ mountain bluet (Centaurea montana). …and yes, practically black in others. …but in bloom, they’re such a deep purple that they could almost pass for black, especially from a distance. Over the last few years, I’ve grown very fond of ‘Jams ‘N Jellies Blackberry’ rose periwinkle (Catharanthus roseus). 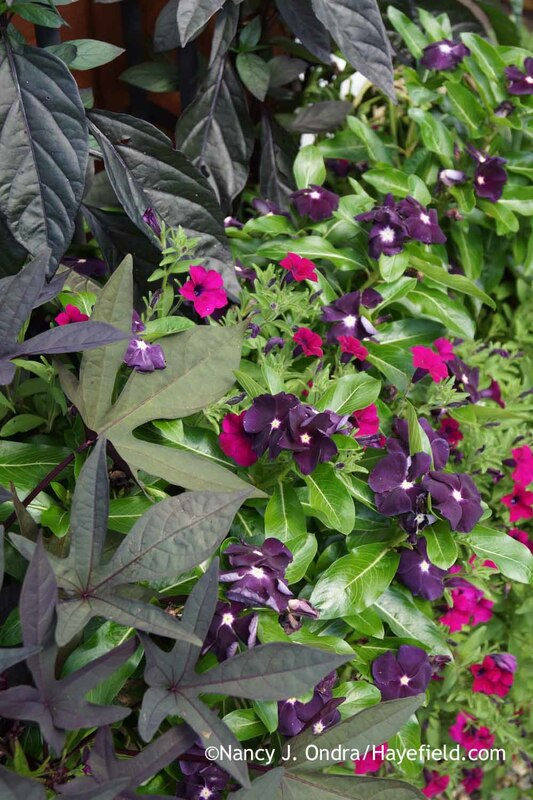 It’s on the deep purple side, not truly black, but it’s one of the best annuals I’ve found for a definitely dark color and abundant blooms through most of the growing season. 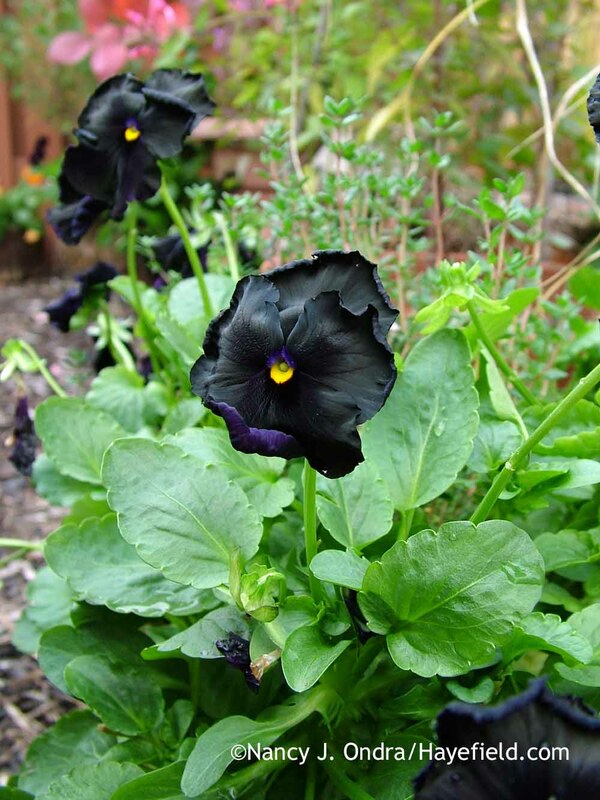 The floral pick for one of my five favorite blacks, though, has to go to the black pansies and violas (Viola). From classics like ‘Bowles Black’ and ‘Molly Sanderson’ to newer strains such as ‘Accord Black Beauty’ (also sold as ‘Black Accord’) and ‘Sorbet Black Delight’, they never disappoint, and I find them absolutely irresistible whenever I’m lucky enough to see plants for sale. 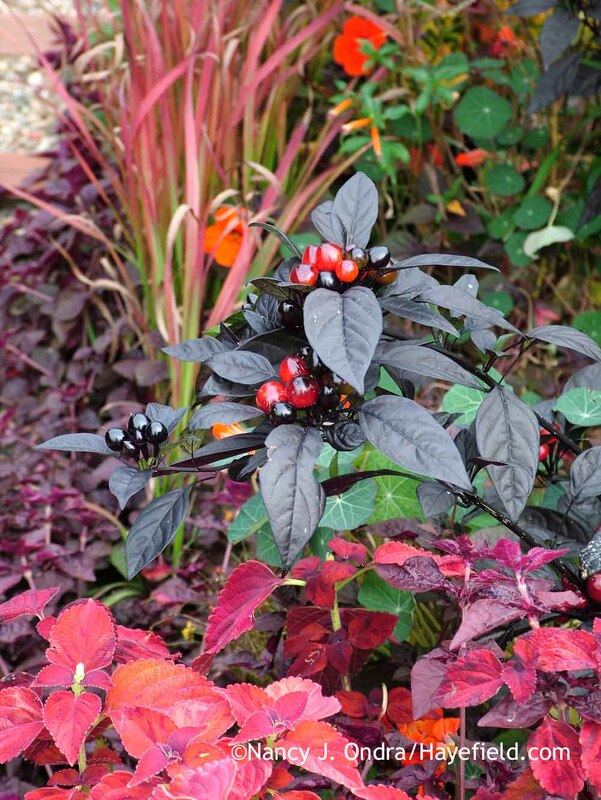 ..and some deliciously dark coleus as well, such as ‘Dark Star’. 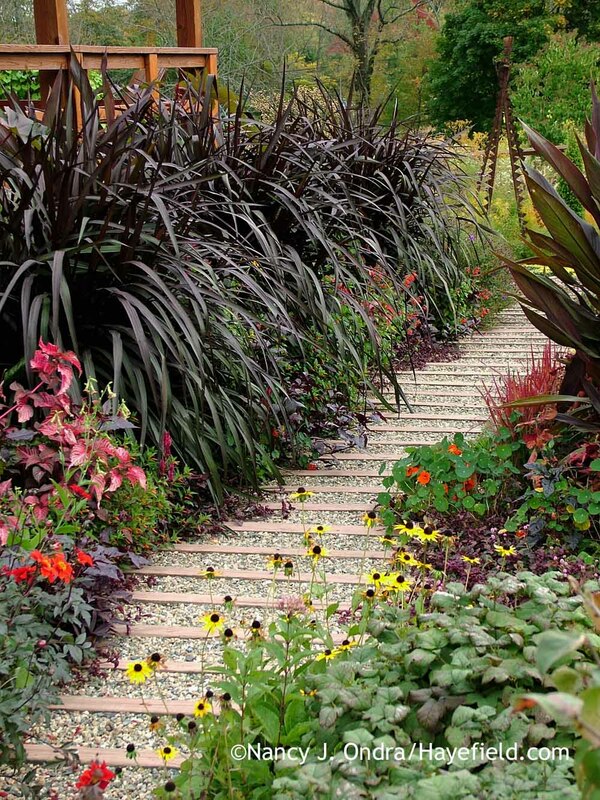 …as can the dark-leaved pennisetums (Pennisetum), such as ‘Purple Majesty’ millet (Pennisetum glaucum) and Vertigo fountain grass (P. purpureum ‘Tift 8’). I persist in trying one or two in the ground each year, but the voles often devour the tubers in later summer, just as the plants are looking really good, leaving a big patch of wilted foliage. 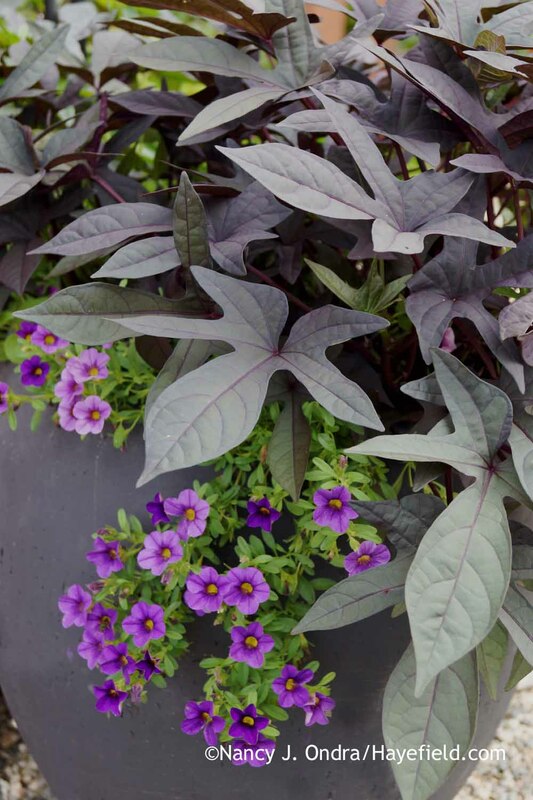 Growing sweet potato vines in containers works out much better for me. I’d prefer that they didn’t flower, as the light purplish pink blooms tend to clash with the bright colors I like to pair with their practically black leaves. But when they do flower, they sometimes set seeds and may even self-sow. 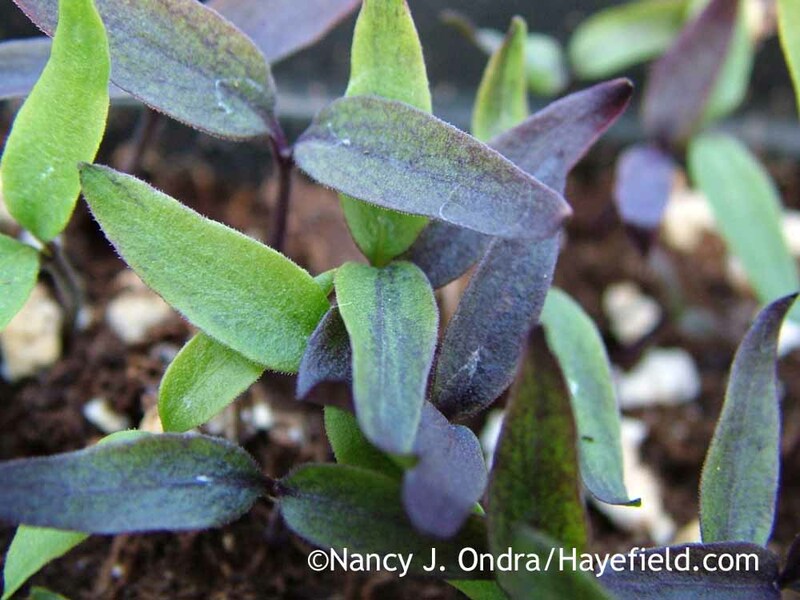 Sometimes the seedlings are bronzy and sometimes they’re purplish, to the point of looking just as good as the named cultivars they came from. 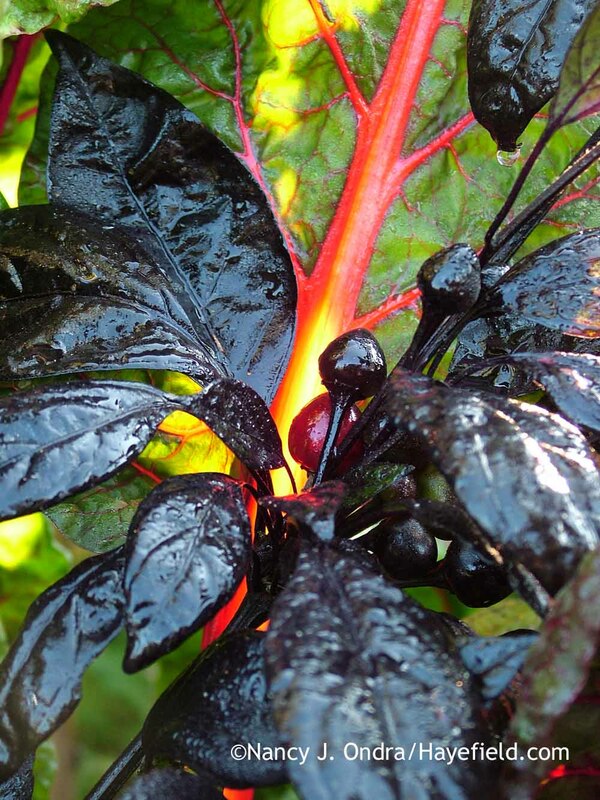 …but once they get lots of sun and heat, they produce an abundance of broad, basically black leaves. The plants thrive in containers and in the ground, too, particularly if you give them rich soil and lots of water. 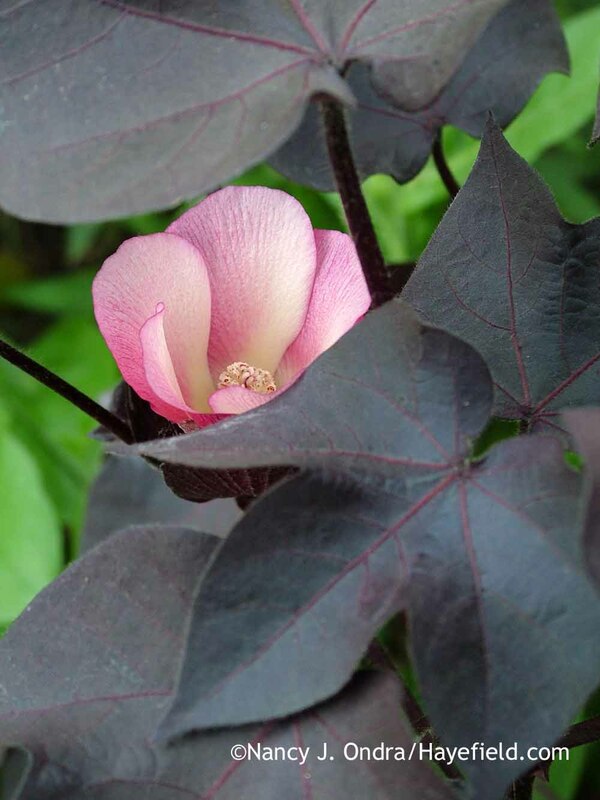 As with the sweet potato vines, you have to account for the flower color: on the cotton, the petals can be anywhere from soft to hot pink, depending on the temperature and amount of light. 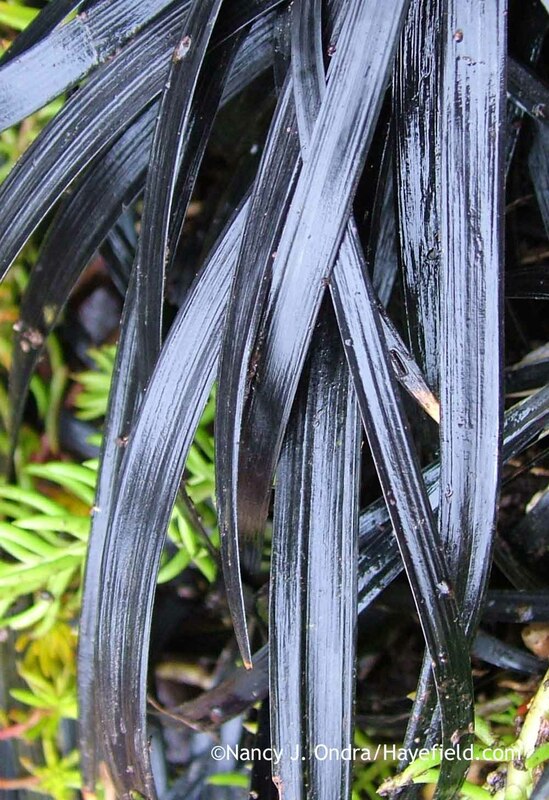 Is it possible to like black plants and not try black mondo grass (Ophiopogon planiscapus ‘Nigrescens’) at least once? 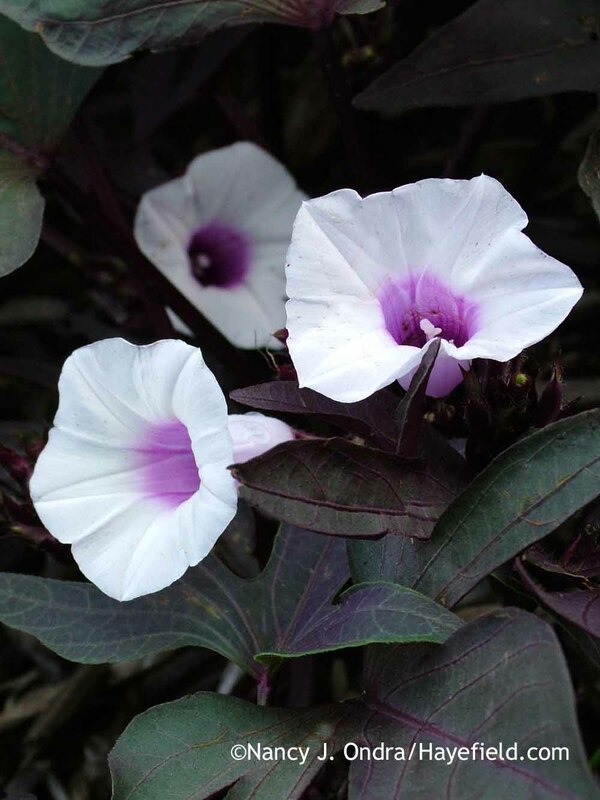 It’s short and relatively slow-growing, so it doesn’t make the same impact as many other dark-leaved plants, and the plants tend to be on the expensive side. Even a few plants can look cool, though, and they can grow into a nice patch after a few years, so I like having them around. I find that the leaf color is richest in full sun; in shadier spots, it’s more of a purplish green. I’m not too keen on the pale pinkish flowers, but they’re not around too long, and they mature into handsome black berries that enhance the effect of the foliage. 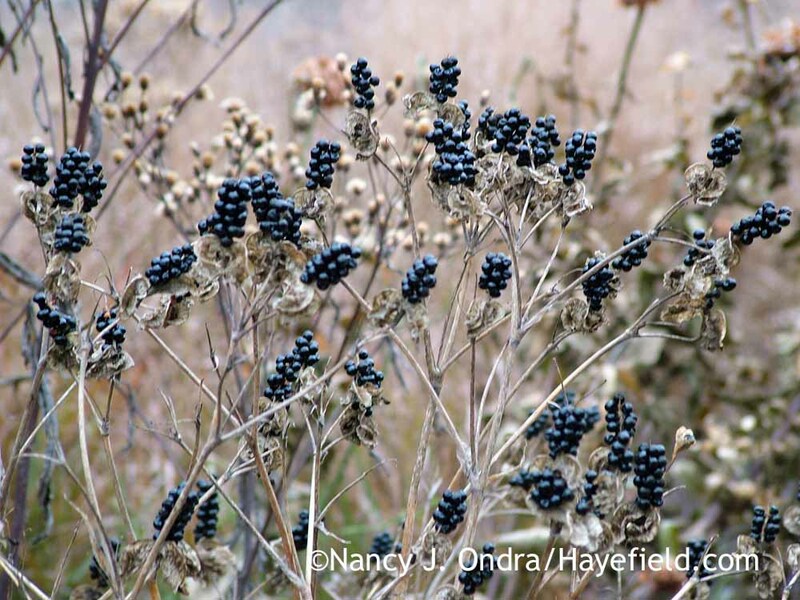 Speaking of black fruits… there are, of course, lots of edible and ornamental plants that produce dark berries, seeds, and seedheads: black currants (Ribes nigrum), blackberries (Rubus), blackberry lilies (Iris domestica), and many more. The interesting challenge is hunting for black as a “something different” color, as in tomatoes. 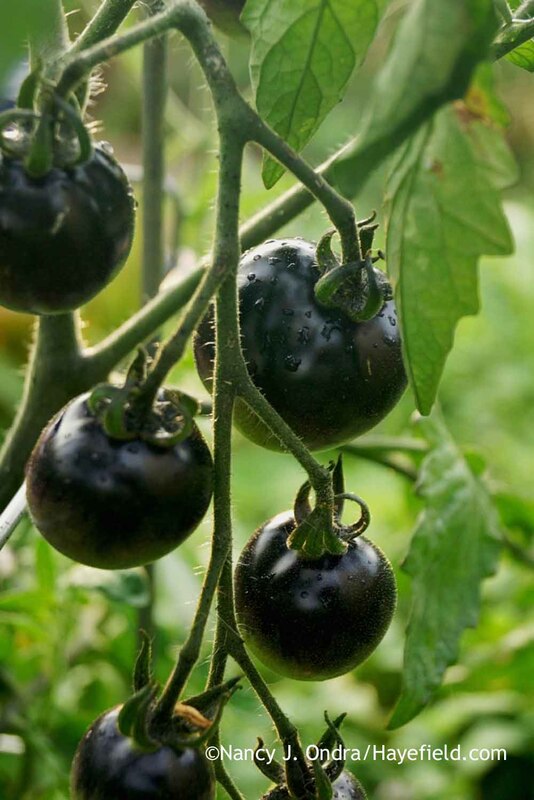 Over the years, I’ve been tempted by catalog listings of ‘Black Cherry’, ‘Black Krim’, and ‘Black Russian’, but from a color perspective, the reality was disappointing compared to their descriptions. When I tried ‘Indigo Rose’, though, I was impressed: the fruits truly did appear practically black. As they ripened, the shaded side of the fruits turned red, but that coloration was hardly visible at first glance. Granted, not everyone is comfortable eating black tomatoes, but they really were interesting from an ornamental perspective. …and then glossy black fruits. 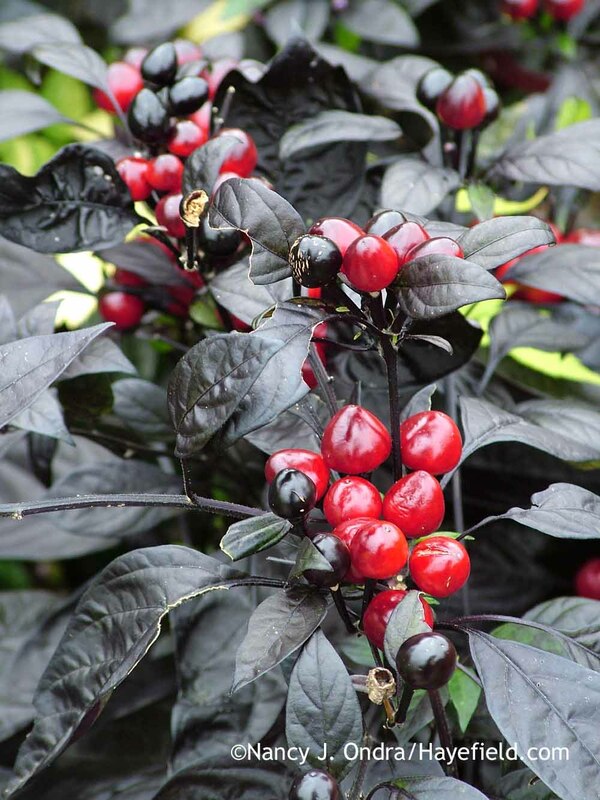 It’s easy to start ‘Black Pearl’ pepper from seed, so you have a nice patch of it without spending a lot of money. 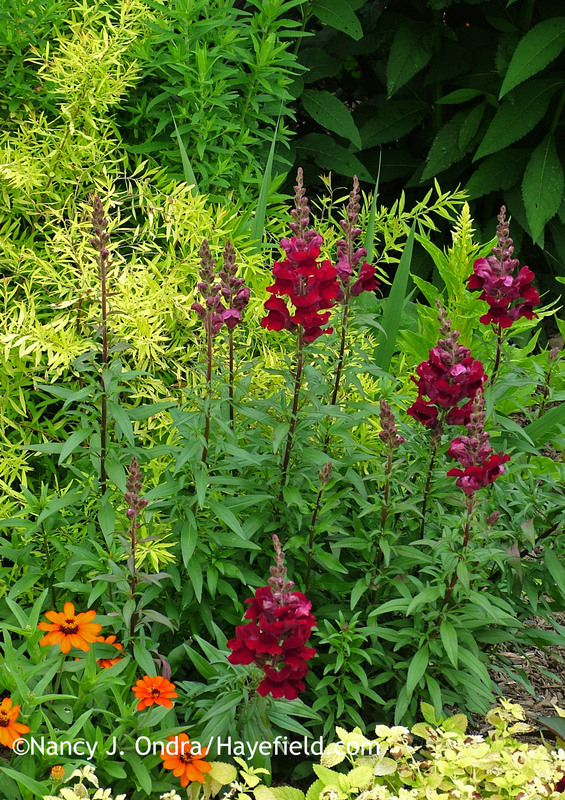 But, it’s large enough that even one or two plants can make a nice impact in a container or border. And, it’s even edible–if you like your peppers really hot–so it’s equally at home in ornamental and edible plantings. So, that’s it for my five favorite black plants (plus a few extras). How about yours? And so many more left to try…. Good morning, Sue! I knew this was going to happen: As soon as I hit “Publish” on the post, I thought of loads of plants I could have included. Yes, you’re right about the ligularias: ‘Britt-Marie Crawford’ definitely should be on the short list, and the cotinus too. Lucky you to have the tulips multiply; I’m lucky to get 2 or 3 years from them. I think I may have to restock this fall. Hope you’re doing well and getting in shape for the spring gardening frenzy! On agricultural okra and cotton, the flower changes color with pollination. Perhaps the same is true with the ornamental? Thanks for that insight, Marian; how interesting! I always assumed it was temperature, but I will pay closer attention this year. Beautiful choices! I have a very deep brown fence running the length of my garden border, so I have gone over to the light side, unlike you “Luke Skywalker”! What really strikes me is the unavailabiiity of many of these plants in my market any given gardening season. I grew Black Mamba petunia a couple years ago and liked it, but did not see it last year. In a white pot it was very striking. Barberry Concorde is nice. 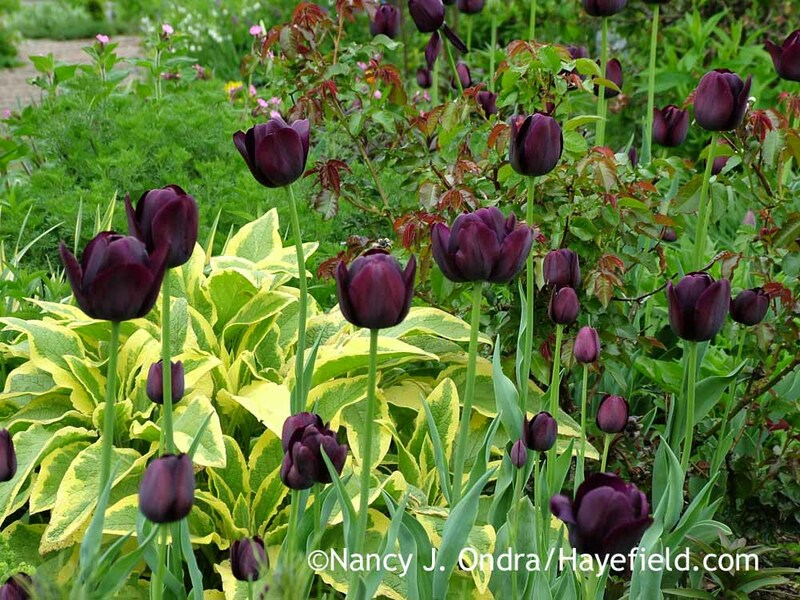 The peony style tulip, Black Prince (?) is one of my favorites. Nine bark Diabolo is on my list for “black” foliage, too. Ah, yes: I imagine you wouldn’t want to add much more dark stuff against a fence like that. I’m with you on Diabolo ninebark, and yep, there are several lovely “black” tulips. I’m glad you mentioned the black petunias: I’m always tempted but haven’t tried them, because I don’t have much luck with the hybrids. I will have a go this year, if I can find them around here. I love your first line. We do have to broaden our idea of colors when we garden. Even the largest Crayola Crayon box doesn’t cover the colors of the garden. This time of year I crave this color so much it is painful. Your post is so timely. Hi Lisa! It’s a tricky subject for gardeners, isn’t it: colors can look so very different over the course of a day and a season. I’m with you on needing a color infusion right about now. There’s still some green, and lots of browns and grays, but yellows, oranges, and reds would be most welcome. 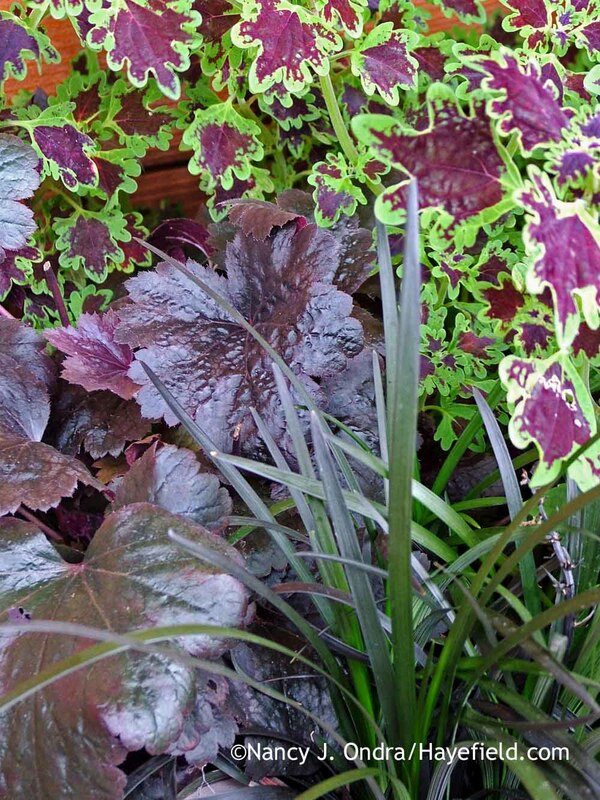 For shade, also black begonias like ‘Black Taffeta’ planted in the ground. Now do “brown,” Nan! 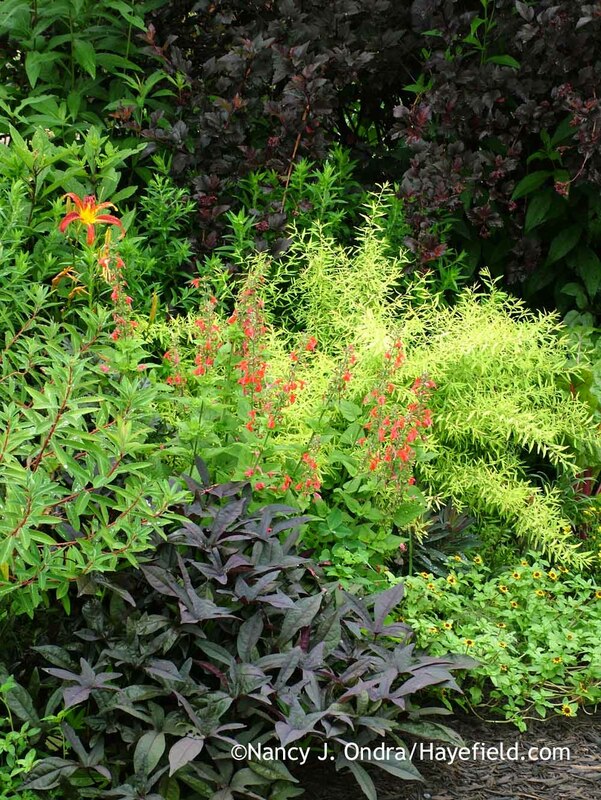 Rusty coleus, brown Carex, bronze foliage, copper foliage, “chocolate” foliage, brown Heuchera, bronze sweet potato vine, some of the Acalyphas, Leptinella, bronze Rodgersia, lots more — I love browns with hot pink and orange. That’s a great idea, Nancy. 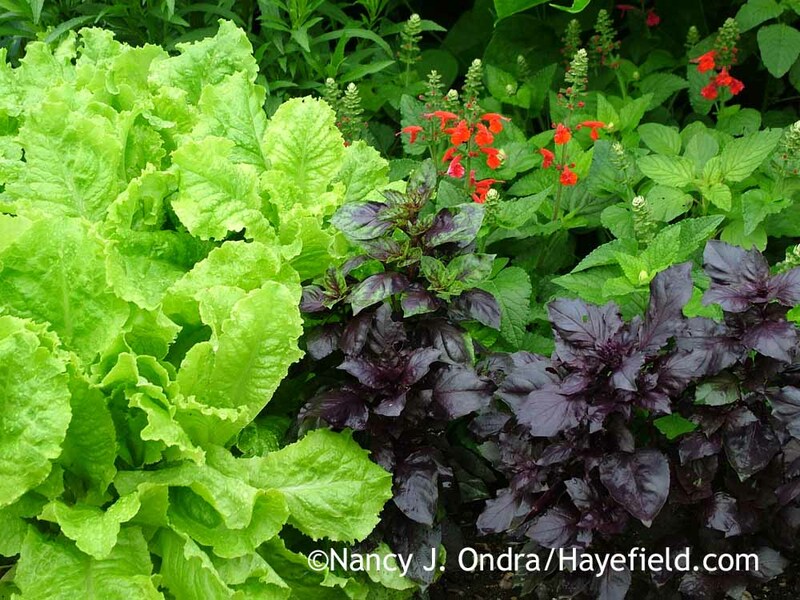 I wrote a “brown” post ages ago for Gardening Gone Wild but should revisit the topic. I really love those bronzy sweet potatoes, in particular. With the rain falling today I was in a black mood but looking at your photos has lifted my spirits; thank you for making me see foliage of a different color. What great opportunities await!! 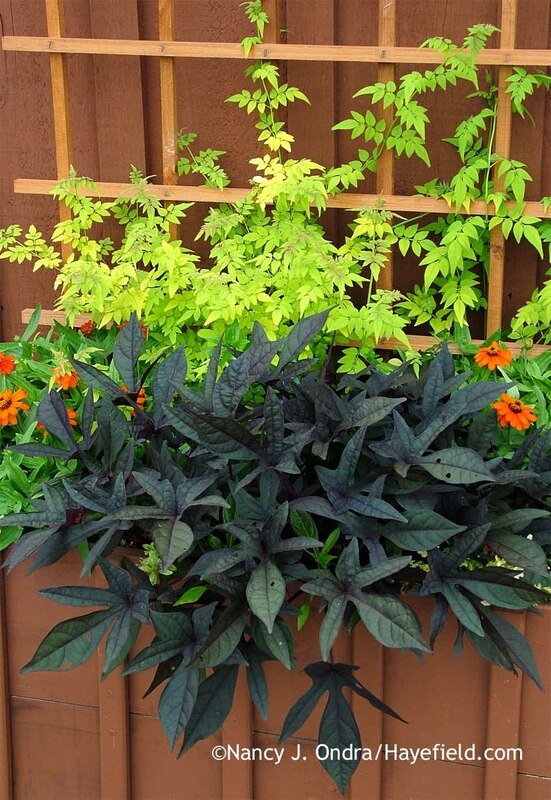 Black foliage against lime green…that’s my plan. Now that you mention it…perhaps I should have chosen a cheerier color for this time of year? I’m glad you didn’t find the black too depressing. The black/purple-and-chartreuse color combo isn’t as trendy now as it was a while back, but I never get tired of it: there are just so many great plants to work with! Hi Nancy. I used to start the pepper seeds indoors on a heat mat but now usually just leave the plants in the garden so they can self-sow. The seedlings don’t show up until mid- to late June, but it’s easy to transplant them into containers or into gaps in the garden, and they grow quickly in warm weather. I too have had some trouble getting cimicifugas established. I have much better luck when I start with very small plants, but you don’t often find them for sale that way. Once they get going–after several years–they do all right here, and my soil is definitely on the acid side. I’ve haven’t sown snapdragons for many years, but if memory serves, I had the best results when I sowed them in February or early March and set them outside so they’d be exposed to some cold temperatures. Wonderful combinations and thank you for the introduction to black-leaved cotton! Hi there, Kathy! Isn’t it a thrill to meet a lovely new plant? The cotton really deserves to be more widely available. The pearl pepper looks awsome and must try. The one that I received the most attention from my yard was Vertigo. Plant it and step back! I tried a few dark leaved dahlias which I liked also, but did not bloom until August for me. Thank-just what I needed in January. Hah – yes, you really need to be aware of the potential mature size with Vertigo, don’t you? When you buy it (if you can find it), it’s usually not much bigger than the usual purple fountain grass, but it can get huge by the end of the season! I’ve grown ‘Black Cherry’ for years now and have never seen it as light colored as the one you have pictured. Even in a lot of shade they just look more brown than dark purple. Never red. I got mine from Baker Creek if you want to try again. As a side note: the black color actually denotes a ton of nutrients such as anthocyanins. 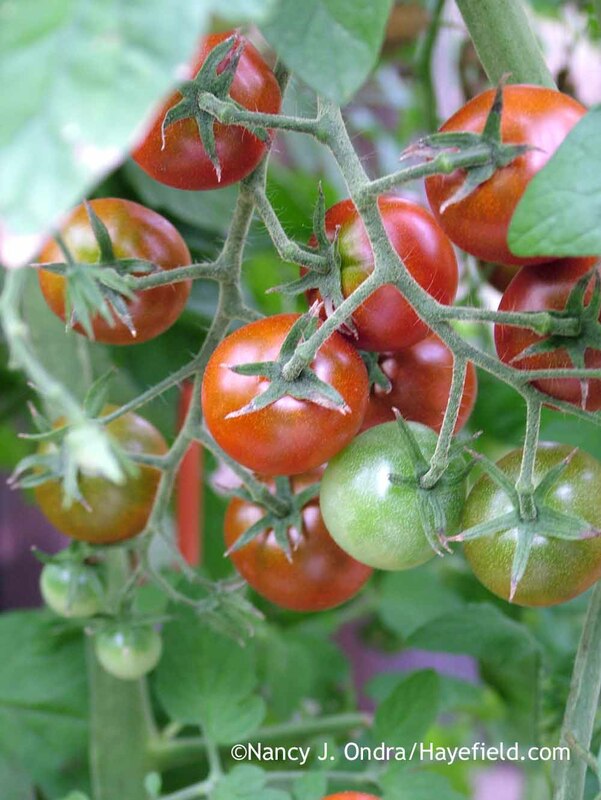 In nutritional comparisons, black tomatoes usually come out on top. Love the black theme though. 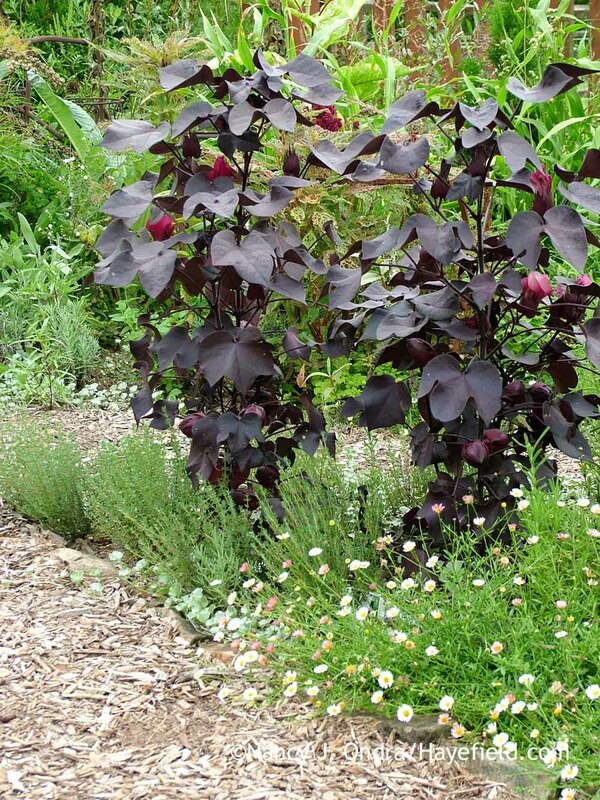 I’ve had a fascination with black plants for years and will certainly be trying a few of these out. 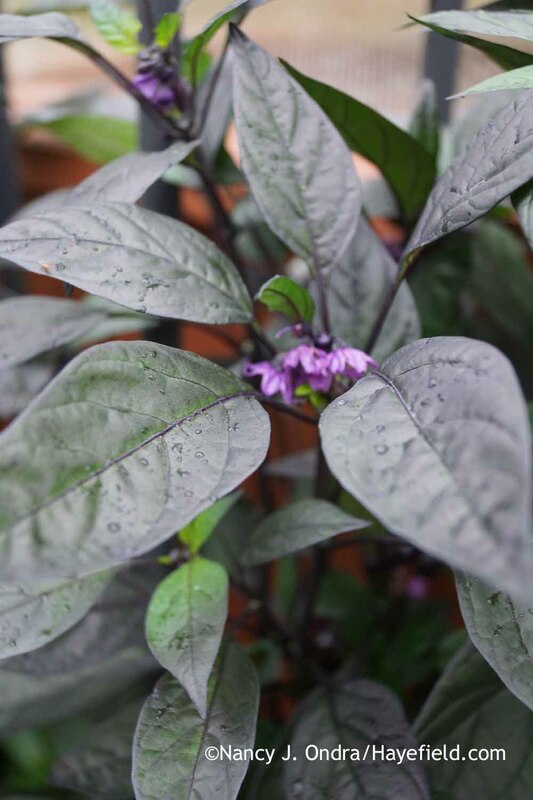 Probably the ‘Black Pearl’ pepper. It could indeed be that I didn’t get good seed for the ‘Black Cherry’. 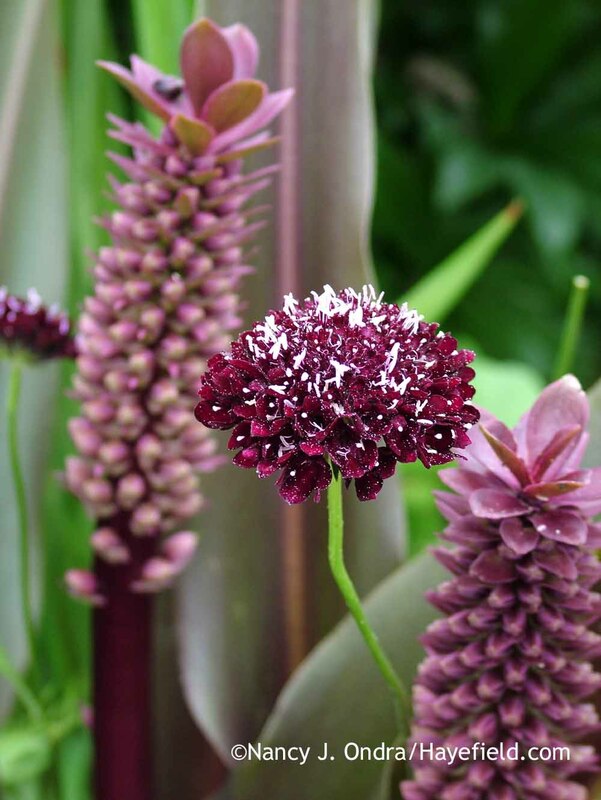 That has happened with some of the black flowers, too: They turned out distinctly red or purple when I knew that they ought to be much darker. It’s a good reminder that it can be worth trying several times if you don’t get good results from the first attempt. Years ago, I bought a book on black plants for a friend who’s always looking for them. I think your post provides a better (and more honest) round-up than that book did so I’ll be sharing your post with her. 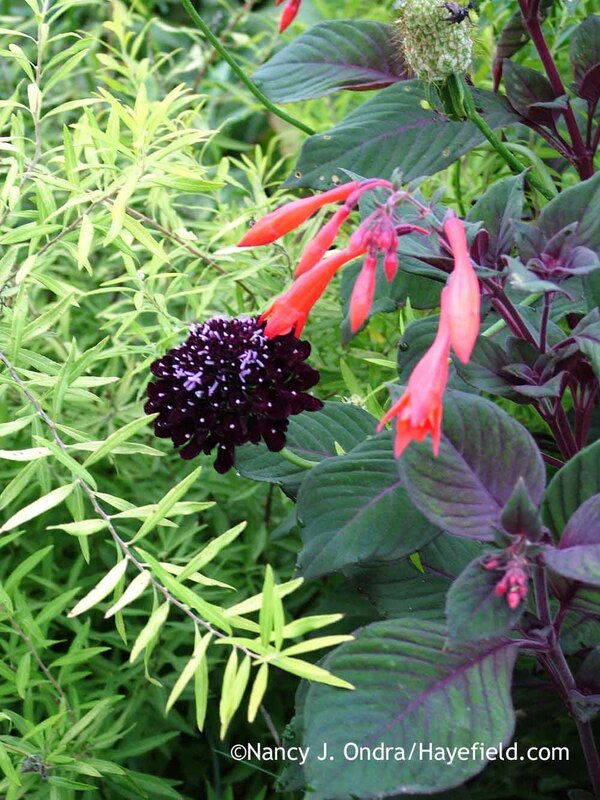 I don’t have anything in my current garden that I can claim is truly black – the closest I can come is Cordyline ‘Renegade’, which is really more of a dark burgundy but it seems to hold that intense color better than the dark Phormiums I’ve previously planted. Thanks, Kris! 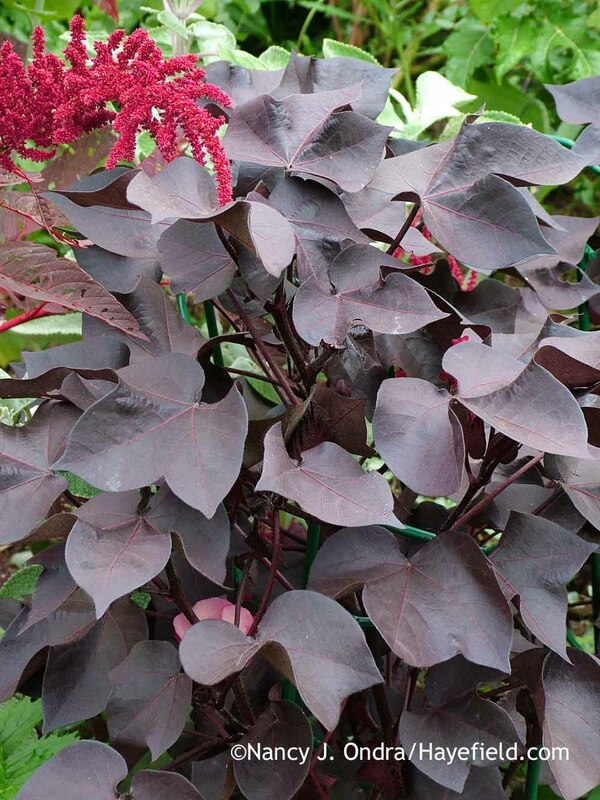 It’s all very subjective, as you know, and a lot depends on the growing conditions and time of year: Blooms that look decidedly black in cool weather can be purplish or reddish in warmer conditions, while foliage can get more greenish in shade or bronzy in strong sun. All the more reason to keep experimenting. Thanks for sharing the info on the cordyline. We don’t get much access to phormiums and cordylines here in PA! I have worked hard to have plants in the garden that will still bloom during the winter when light is less and the skies tend to be gray and overcast a good deal of our time. I will not be able to touch the gorgeous colors in your summer garden, but there are still options. If I could depend on winters being as mild as the one we had until 2 weeks ago, I’d follow your lead, Charlie. I now have a much greater appreciation for winter interest! Since the cold has kept me indoors in recent days, I find myself more focused on seed-starting and garden dreaming now and less on the outdoor plants. I must say, though, that having the green grass paths has been much more pleasant to look at than the dreary brown wood-mulch ones, so maybe I can count that as a start to more winter interest here. Oh, that Black Pearl Pepper, that’s one I’ll be trying this year. Your “Black Showing” sure put a bright light into my day. And look, our rainy night turned into a sunny, mild day here in our part of PA. I hope you can get outside to enjoy it! 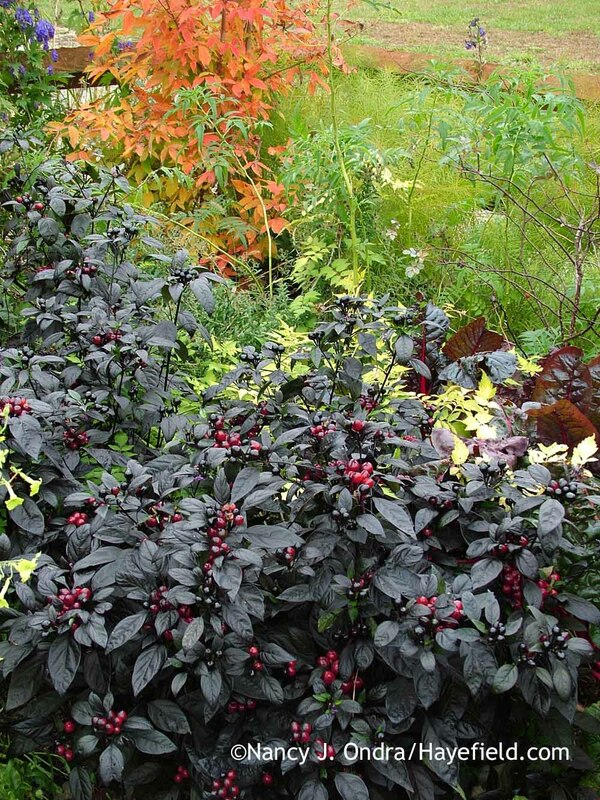 Wow, that black pearl pepper is sure a standout in your garden. Looks like a great candidate for mixing into the flower beds rather than the raised veggie beds. Nice post, Nan! 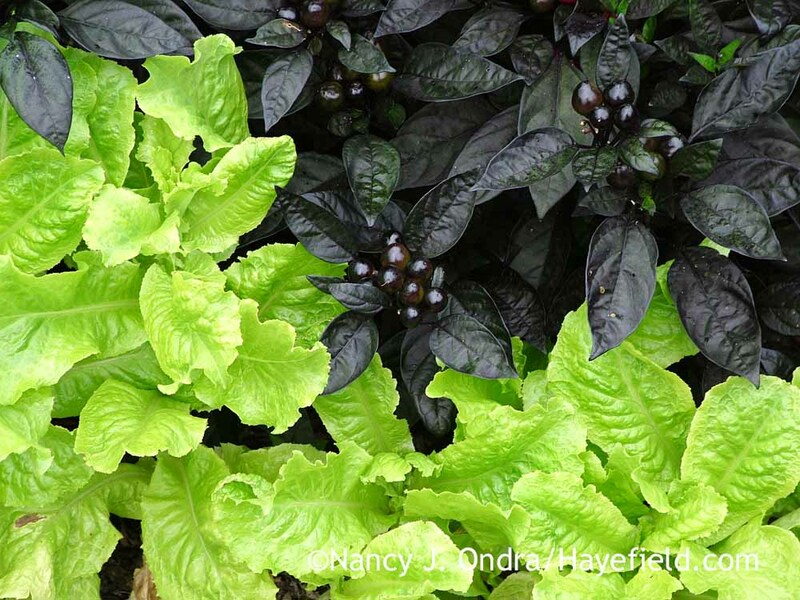 Absolutely, Ginny: It’s gorgeous in ornamental beds, borders, and containers, and also much less expensive than many other “black” plants that aren’t nearly as stunning. 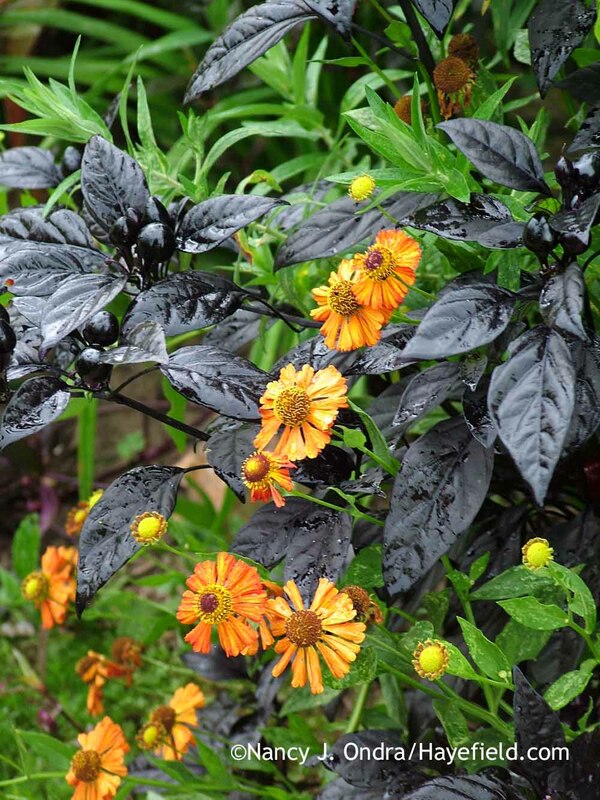 I echo a prior commenter’s mention of Britt-Marie Crawford ligularia as a gorgeous black-foliage plant, and your mention of Black Knight Scabiosa which in my garden really is near-black. I’d also add Little Devil ninebark, which is the richest darkest most amazingly beautiful black of any ninebark cultivar I’ve seen, and has shown little sign of mildew for me. 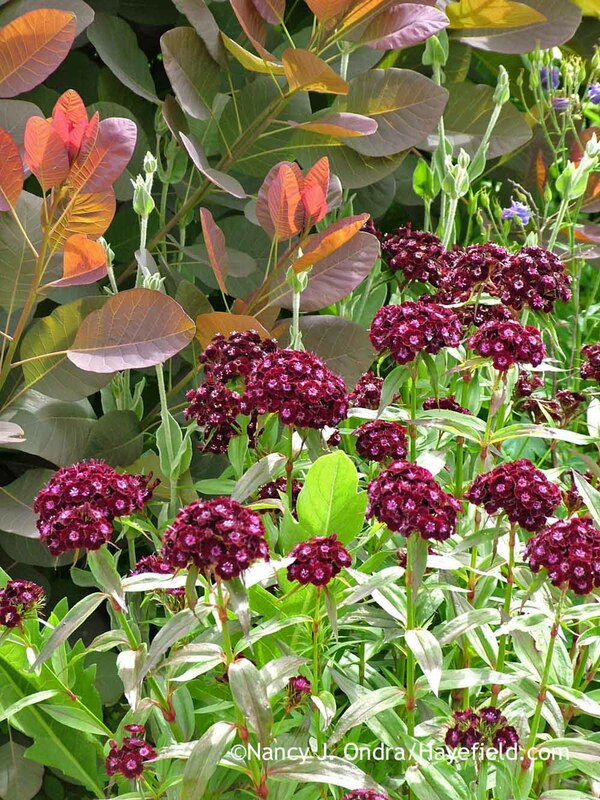 Purple Emperor sedum is a purple-black in my garden, and Sambucus nigra Black Lace comes by its name honestly, IMO. 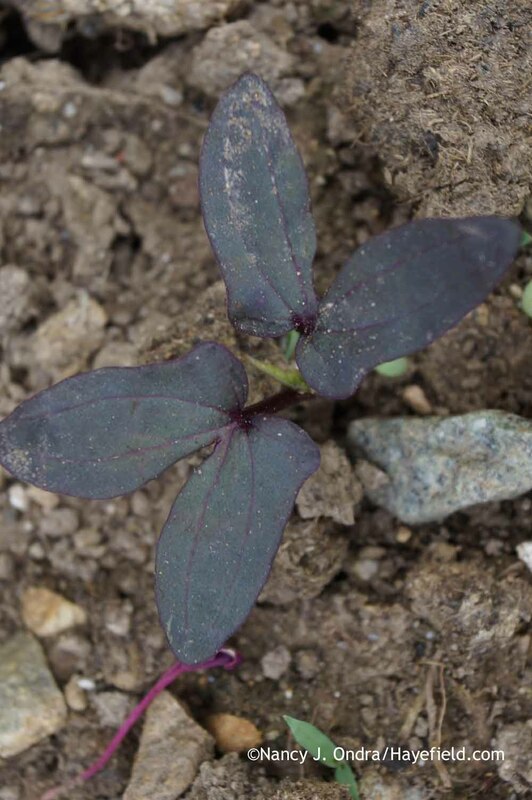 I tried Lobelia cardinalis Black Truffle and as I recall the foliage really was a deep red-black, but the plant itself was floppy so out it went. Those are all terrific additions, Kate. It’s good to hear about the Little Devil ninebark’s mildew resistance. I don’t have trouble with Diabolo but the seedlings I’ve grown out of it have a real mildew problem. I’d completely forgotten about the elderberries, too! Love a touch of black in the garden. 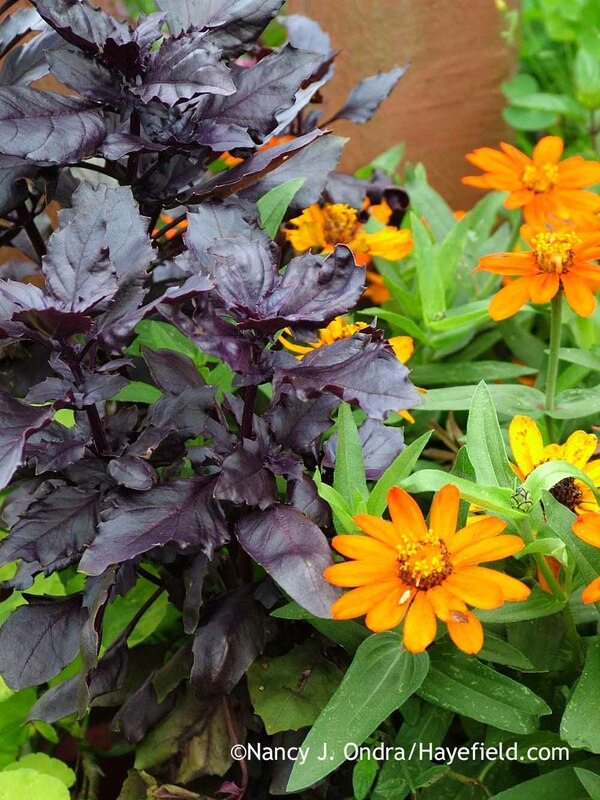 Have any new black flowers/plants you’ll be growing this year? Hey, Mel. I’m not sure if any new blacks will be on this year’s list. I think I’ll be focused on seed production of my favorites–especially the black cotton! I hear you. I love it too. Before you shared some seed with me, I had no idea what a cotton plant looked like. I still find the cotton fascinating. I have a pile of the fiber sitting in my office, left over from cleaning the seeds; I just can’t bear to throw it away! That sounds like an inspired combination, Barbara: icy blue and white would really pop against the black background. I adore those high-contrast pairings. The good blacks are fantastic with rich reds, yellow, and oranges, and they’re terrific with pinks, silvers, and white too. I, too, want to thank you for “telling it like it is” when it comes to blue and purple in the garden–as well as black. It’s been years since I grew Black Prince snapdragons myself, but I remember the leaves being much darker for me than you show in your picture. No, they weren’t close to black, but at least they looked like they were trying! Even without photoshopping, color can vary in one garden as well as from one garden to another, so I don’t think anyone can know what a plant’s color will look like until they try it in their own garden. Sometimes the catalogs aren’t lying, they just had different results! Yep, sometimes my ‘Black Prince’ snapdragon leaves have been darker–same for ‘Black Adder’ and ‘Sooty’ dianthus–usually when the weather has been on the cool side; they’re normally green by bloom time, though. And you’re quite right about the color variations from garden to garden. I don’t think most catalogs are being deliberately deceitful: just, perhaps, overly optimistic sometimes. Some of the photos are really egregious, though, such as the “black” Dicentra spectabilis (which apparently also comes in sky blue and bright yellow from the same source). Granted, I’ve not grown every variant there is, but I have to be a little cynical about those. I hope the poppies turn out really well for you, and the rhododendron, too: it sounds lovely. Ugh about the lace bugs; I haven’t seen them for years, but I remember how bad they can get. Hi Nan. Intriguing post, especially since I’m doing my second seed order, I’ll be looking out for that Capsicum ‘Black Pearl’! Good ones! And ‘Fishnet Stockings’ coleus too, of course! Nan, your wonderful color saturated post was a feast for the eyes and the soul. Loved the first shot with the chard in the background and the black/chartreuse combos, especially the jasmine vine. Who cares if it is cutting edge now or not? The Queen of the Night tulips against the vibrant yellow gold of Axminster’s Gold comfrey was a marvel. I also liked the row of dark millet down the front walk of your house. When you plant out that millet do you need more than one plant to achieve that lush clump like effect? I think of it as a fairly sparse grain… I’d really like to try it especially since it looks like a good food source for the birds, both wild and my pet cockatiels. On another note my garden was featured on Garden of the Week on a site called Charlotte’s Daylily Diary. 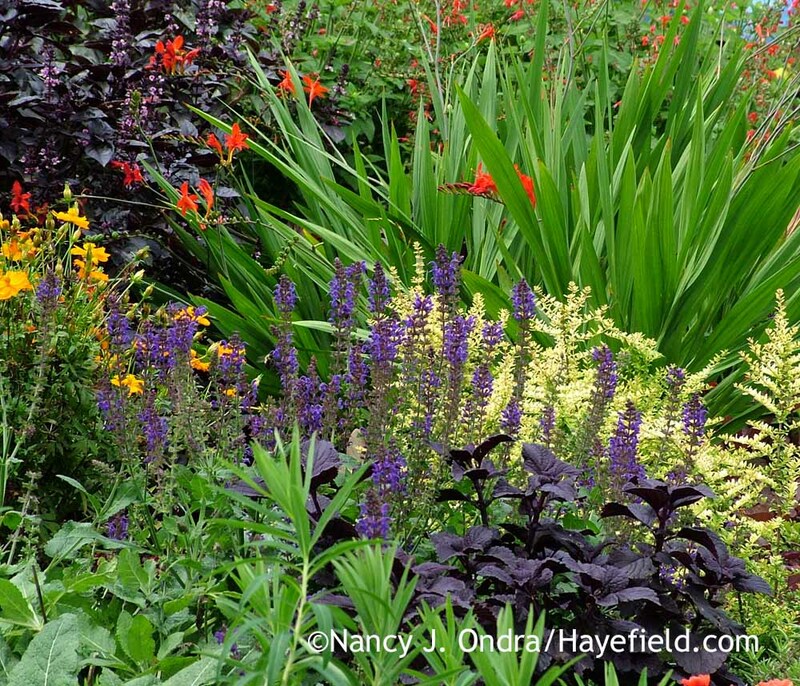 My garden features mixed beds of shrubs, perennials and lots of daylilies. I know they are not your fave but I have learned so much about color and design from you I thought you might want to take a look. If you go to http:// http://www.daylilydiary.com and click the purple button in the upper right hand corner you can tour Eden’s Edge and several other lovely gardens. Looking forward to your next post as ever. Hi Kate! If you want a millet type of pennisetum for seed as well as foliage interest, I’d suggest ‘Jester’, ‘Purple Majesty’, or another of the Pennisetum glacum strains. Vertigo, a selection of P. purpureum, usually doesn’t flower until very late and is, according to its patent, “pollen and seed sterile.” The planting of Vertigo in my photo includes just three plants, filling about 12 linear feet of border. You’d probably need about 6 plants of ‘Purple Majesty’ to create a similar look. Its seed is a little pricey at first, but then you can save some from year to year for replanting. And hey, thanks for sharing the link to the feature on your garden. (Here’s a direct link for anyone else who’d like to visit: http://www.daylilydiary.com/2_KatePatrick/index.html). Your borders are absolutely lovely. And wow: That combination of the echinacea and the pink flamingo really was a perfect color match! Happy New Year! Nan. 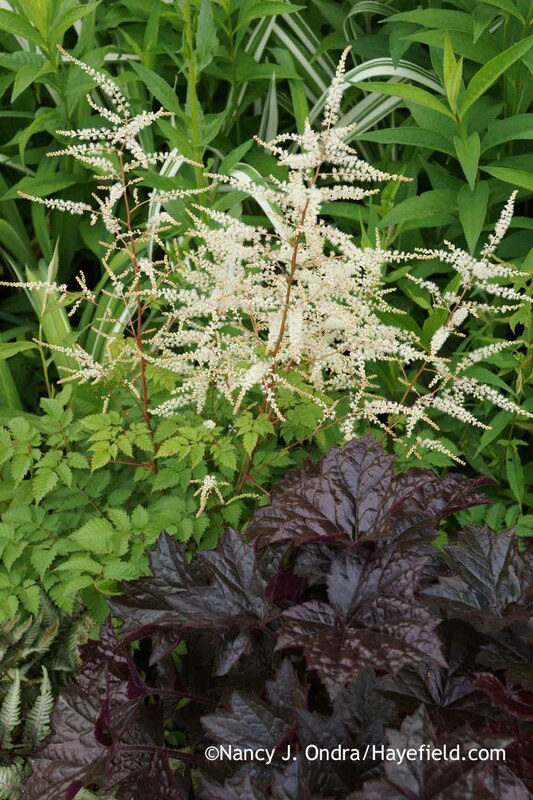 I have several so called ‘black plants’ which you have mentioned, Heucheras, Opiopogon, cimicifuga. 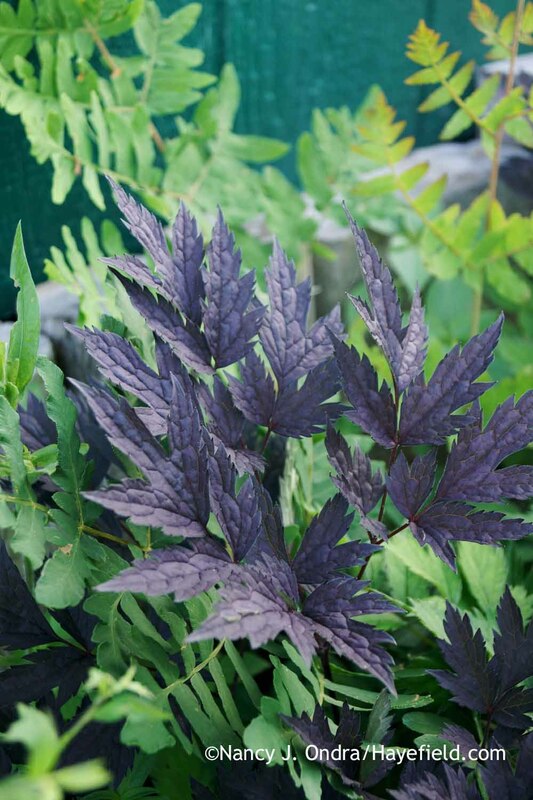 I also have 3 Sambucus shrubs whose foliage is purple but, looks black at certain times, also Dahlia, Bishop of Llandaff, Ajuga,(Black Scallop) eupatorium (Chocolate), Euphorbia (Black Bird), Sedum (Purple Emperor). Saxifrage (Fortunei). I took a leaf out of your book a year or so ago, my garden now contains many shrubs, perennials with coloured foliage, so it is always a delight when you include posts like this one. Good to hear from you, Allan! Yep, as beautiful as flowers can be, it’s anything-but-green foliage that really speaks to me. I could have made this post twice as long! 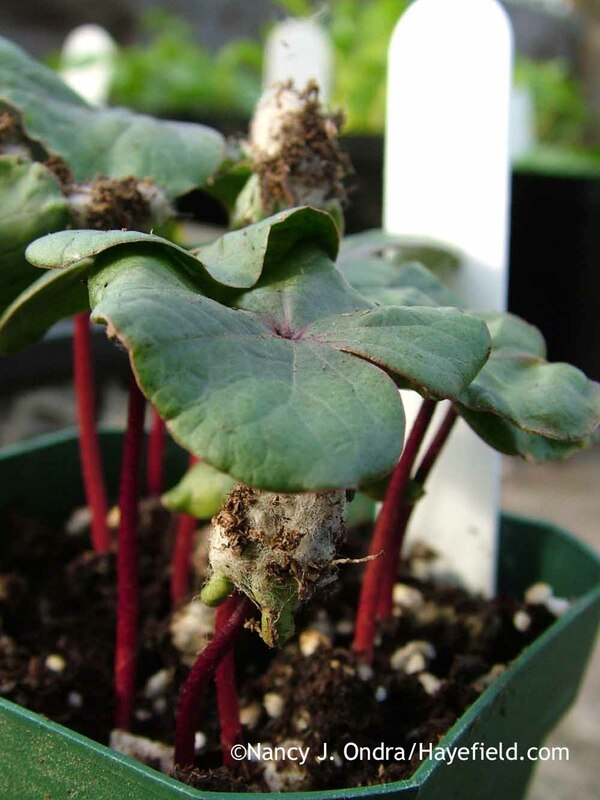 I love your pictures of the cotton, what an amazing plant! I’ve tried a few times with it but something keeps killing off the seedlings before they amount to anything. I bet it’s some fungus -too cool temperature- combo but haven’t been able to fix it. 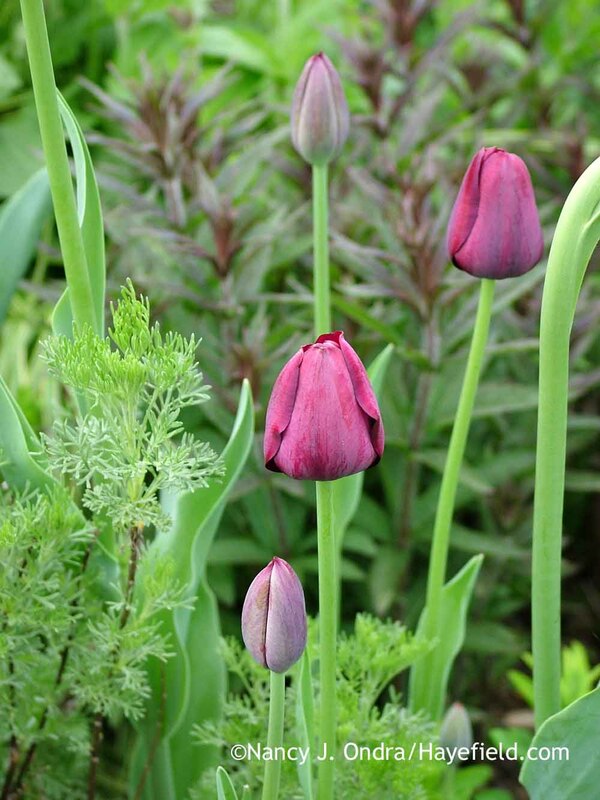 The black night tulips look great in your border with the comfrey. What a rich combo, and the vertigo grass is a favorite of mine too. I tried a larger type a few years ago and it was really something, but the smaller ones put on a great show as well. That’s interesting to hear about the cotton. I wonder if it would be worth trying to germinate them on moist paper towels instead of growing mix? Mmmm hmmm…the color topic is already on my wish list for book projects! Wonderful post; anything with color in it is welcome this time of year! Have you tried Dianthus barbatus ‘Heart Attack’? The flowers in the first stages of opening are the blackest red that I have ever seen, although they change to a dark burgundy as they mature. The foliage is very dark in the early part of the season, especially in early spring, but then changes to a dark green. It is a strong grower and ready to divide after 2 seasons; I plan on spreading it throughout the garden in the spring. 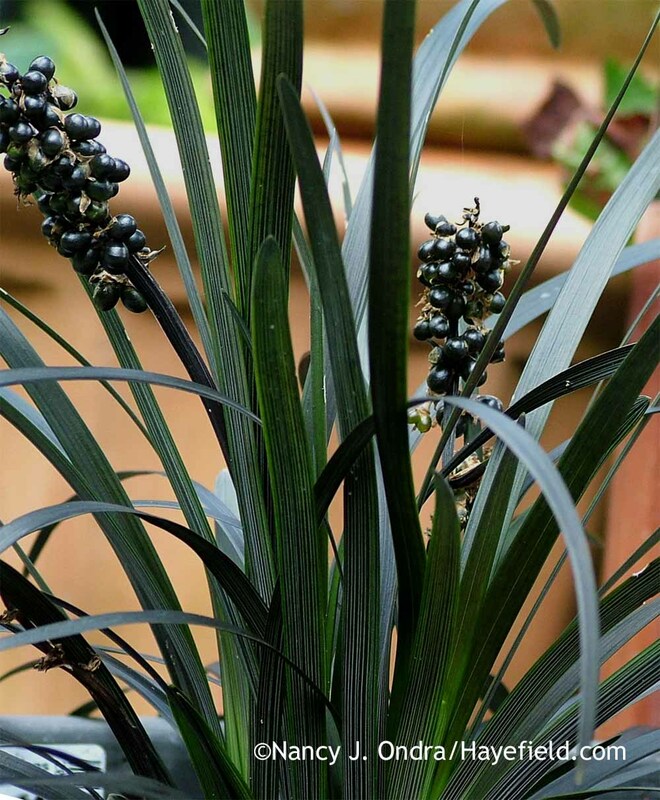 I remember seeing Ophiopogon planiscapus ‘Nigrescens’ and black pansies in a black ceramic pot in an English garden years ago – very dramatic and very hard to photograph. In the same vein, I’ve always wanted to create a small “Ansel Adams” garden, with all black, white, and gray plants, but that’s a little hard to pull off! 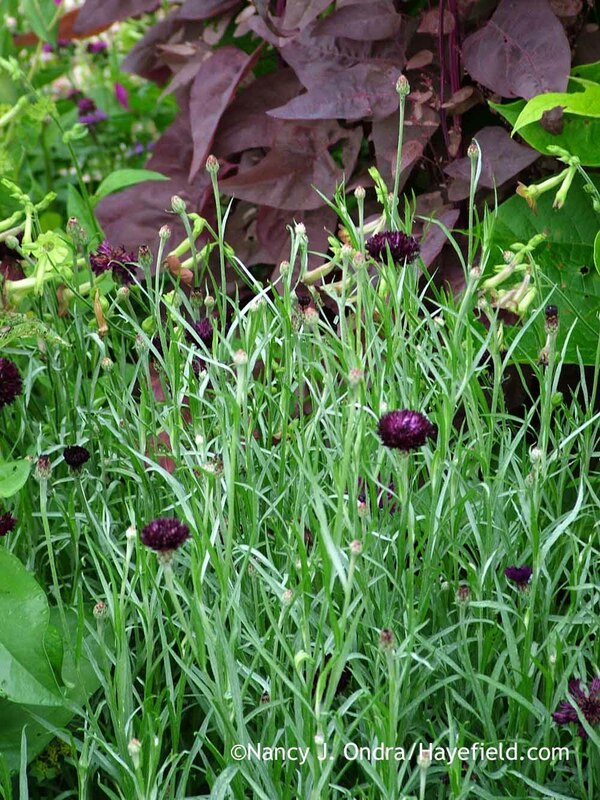 No, I haven’t tried ‘Heart Attack’–I tend to stick with seed-grown plants, since they are cheaper–but it’s good to hear that it’s worth trying. You’ve got me thinking now about a black-, white-and-gray idea: That really would be a fascinating project! Nan,how did the ‘Indigo Rose’ taste? Your post made me remember that I have some old Black Pearl seeds .I’ll have to try them again this year.Just remember to wear gloves when planting this seed. I learned the hard way! That’s a good question, Cindi. I last grew them in 2014, I think, so I don’t recall the flavor exactly, which I guess indicates that they weren’t so fantastic as to be memorable. I do remember that we ate a lot of them, though–the plants were very prolific–so they must have been decently good, at least. Interesting that you mention wearing gloves when handling the ‘Black Pearl’ pepper seeds. I’ve never noticed a problem at planting time, but it’s definitely an issue when cleaning the seed. I harvested a few of the mature fruits last fall and let them dry to get the seeds, and I wore gloves to prevent a repeat of the burning fingers from the previous year. What I forgot, though, was that crumbling the dried fruits makes pepper dust, and wow does that scorch your nose when you breathe it in! So, a dust mask is also advisable for seed-savers. Hi Nancy! Your newest book just came in the mail form Amazon. I can’t wait for a chance to curl up by the fireplace and read about container gardens. I have a question for you—does brother Tim still sell Jakoti hand shears? I’ve misplaced two (well, actually one was stolen) already and need to purchase a third pair form him. I can’t face spring and all the perennial grasses etc. I must cut down without them. Jakoti jand shears make the work so much easier and enjoyable. Besides the shears, I have misplaced Tim’s contact information and your blog link on the original Shear Genius post isn’t working for me. Hey there, Liz! I didn’t even know the containers book was out yet, so thanks for the news. I really hope you enjoy it! I’m grateful, too, that you let me know about the trouble with Tim’s website. I’ll email you directly once I hear back from Tim and we get it straightened out. I too would not want to face another year’s garden cleanup without my Jakotis! 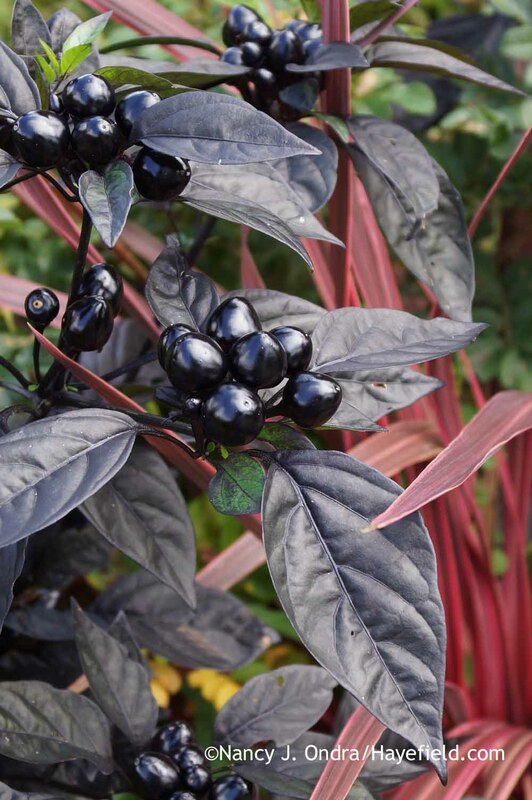 I have a lot of black plants in my garden; one of my favorites that you don’t mention is ‘Black Beauty’ elder. I have it next to ‘Darlow’s Enigma’ old rose and the white flowers against the foliage of the elder all summer are fabulous. 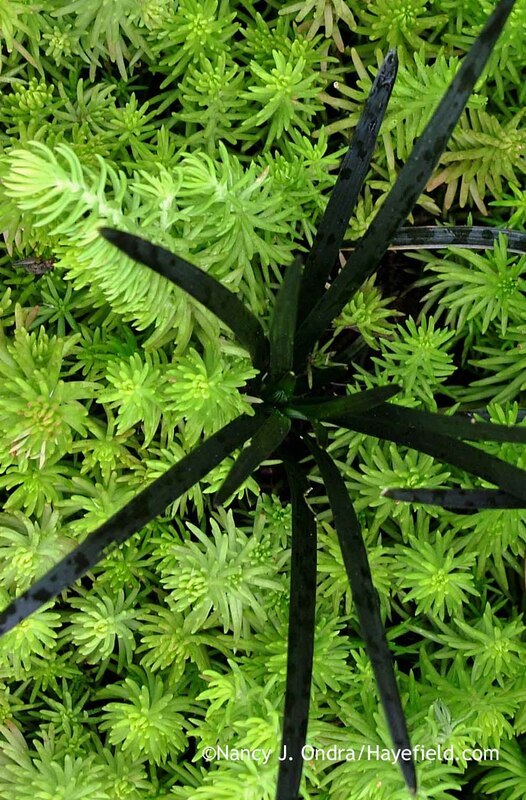 Great post; I’m always looking for more black plants! That sounds like a superb combination, Laurie. I can grow the yellow-leaved elderberries but have never had luck getting any of the purple-leaved ones established here, so I’ve pretty much given up and have to depend on the ninebarks and weigelas for dark foliage in shrubs.